I am still living the life of a high roller in Vegas today but I spent time last week scheduling posts to make sure that you still had something for your reading pleasure. Whenever I'm away from home, I am usually living the life and never want to go back. But once I'm home, I realize that I can't imagine living anywhere else. 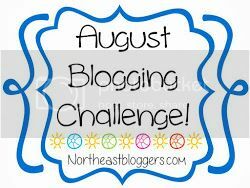 That's why I knew I had to participate in the prompt from the Northeast Blogger Network's August blogging challenge. The prompt went up on Tuesday and it was "introduce us to the state you came from" and it feels pretty good to think about my beloved state of New Jersey when I'm a couple thousand miles away. New Jersey gets a bad rap. Whenever I say I'm from New Jersey I have to tolerate some saying "Joisey" or asking if I know someone from the Jersey Shore show. Seriously, this has happened to me. Even my own boyfriend was down about NJ when we first met (and now he lives here with me so take that!). I was born and raised here and now I'm living and teaching here so you could say I love it just a little. I'm sure I could live somewhere else and be happy but there's something about this state that has my heart. Let me list the reasons why. 1. Everything, and I mean EVERYTHING, is at your fingertips. Sure, Jersey might be a little crowded with the most people per square mile, second only to Washington, DC, but that's only because you can find everything here. We are between two major metropolitan areas, New York City and Philadelphia, and you can take a quick train ride to Baltimore, DC, or Boston. We have our own mountains but we can go skiing in the Poconos in Pennsylvania for only an hour or so ride. We have casinos in Atlantic City and one of the most amazing and famous shore lines. Also you can't live anywhere in New Jersey without a mall or five being at least half an hour from your house. I once read a post from a blogger who had to drive an hour to the nearest Target and thought, who lives like that?! 2. The beach. If you follow me on instagram and it happens to be a Saturday afternoon in the summer, you'll get an eye full of the thing I love most about Jersey. The Shore is no joke and no matter what tries to bring it down (whether the kids from the MTV show or Hurricane Sandy), each summer it's there and better than ever. 3. Our history. Lots of people drive through New Jersey on one of our many highways but if you take a moment to pop off one of those exit ramps, you'll discover the amazing history of New Jersey. Obviously it's one of the 13 original colonies so there's tons of revolutionary history. I have picnicked with my girlfriends where George Washington fought in the Battle of Princeton and turned the war around in favor of the Americans. I grew up a half hour walk from the Princeton University campus, one of the nation's oldest colleges, and it's pretty nice to look at. Ocean Grove is a beautiful shore community that was founded in the late 1800s as part of the camp meeting movement by a group of Methodists. Though it's no longer a religious meeting site, the tents are still up and lived in during the summer and you can stroll around the neighborhoods of gingerbreaded Victorian homes. From the start of our country to today, New Jersey has had a hand in American history. History buffs, Jersey has it. 4. It's called the Garden State for a reason. I hate it when people say it's stupid to call New Jersey the Garden State when it only has refineries and strip malls. Again, get off the turnpike! Simply drive a few miles away from the highway and you will find lush farm fields and stands overflowing with fresh produce. It's the largest producer of eggplant in the U.S. and one of the top producers of blueberries and cranberries. One of my favorite childhood memories is going to a pick-your-own farm and snacking on berries while pretending to fill my bucket. In the summer it's impossible not to find a farmer's market set up in a little town. We are seriously Jersey Fresh. 5. We can eat and eat and eat. No, I am not saying that NJ is fat. In fact it is in the top ten of skinniest states. But it has some of the best food ever. You can visit a diner at any time, day or night, and get a pretty decent meal. And don't even get me started on our Italian food. I don't know why Olive Garden even bothers to operate in a state where there's an Italian restaurant on every corner. You can get amazing Asian food up in North Jersey or an infamous Trenton tomato pie or fresh seafood at a dockside restaurant. Thank goodness we have those strip malls to house our gyms or we would clearly be the fattest state. 6. It's just so, so beautiful. If you haven't lived here or haven't explored it, you might not see the beauty in the state of New Jersey. I can't tell you the number of times it takes my breath away. From the beaches and the wetlands to the mountains and the cliffs and then the amazing and eclectic architecture of its small towns, New Jersey has it all. And thanks to Buzzfeed, you can check it out. These are only a few of the reasons I love my home state so come on down to New Jersey and check it out. There really is no place like home.